Disney Vacation Club – Is it Worth It? If you’ve spent any time around they Disney resorts, you’ve probably heard of Disney Vacation Club – also known as DVC. You may have seen the booths around the parks, the advertisements on the resort television, the plug on Disney’s magical express, or the resorts themselves popping up around the property. Let’s face it, DVC is growing and it’s getting bigger every day. The question I’m asking is – Do you really know DVC? Even if you’ve considered joining, do you really understand the benefits and just how much it could benefit you to join? It is a big decision to make, but it could be one that you never regret. The intention of this post is to un-cloud some of the mystery around DVC, help you understand what it is, tell you some of the facts, and help you decide if it’s right for you! I will say I’m a bit biased because I am a member and I think it’s one of the best decisions we ever made; however, I didn’t buy in immediately. We waited until the right time and now we are so happy we did. Read on for more if you’re curious or curiouser……. Disney owns/manages/builds the resorts themselves; the take home here is that DVC is a Disney company and is not outsourced to be managed by someone else. Thus the DVC properties are built by Disney on their property; in fact, oftentimes, the DVC resorts are simply add-ons to existing resorts. The DVC properties have that same ‘disney magic’ that the other properties have AND all the benefits given to you simply because you’re on Disney property. The DVC properties are slightly different than the typical hotel rooms. The rooms are villa style to accommodate longer stays or larger families. The smallest rooms offered are studios which sleep around 4-5 to larger grand villas which can sleep almost 20. All rooms have some sort of kitchen. 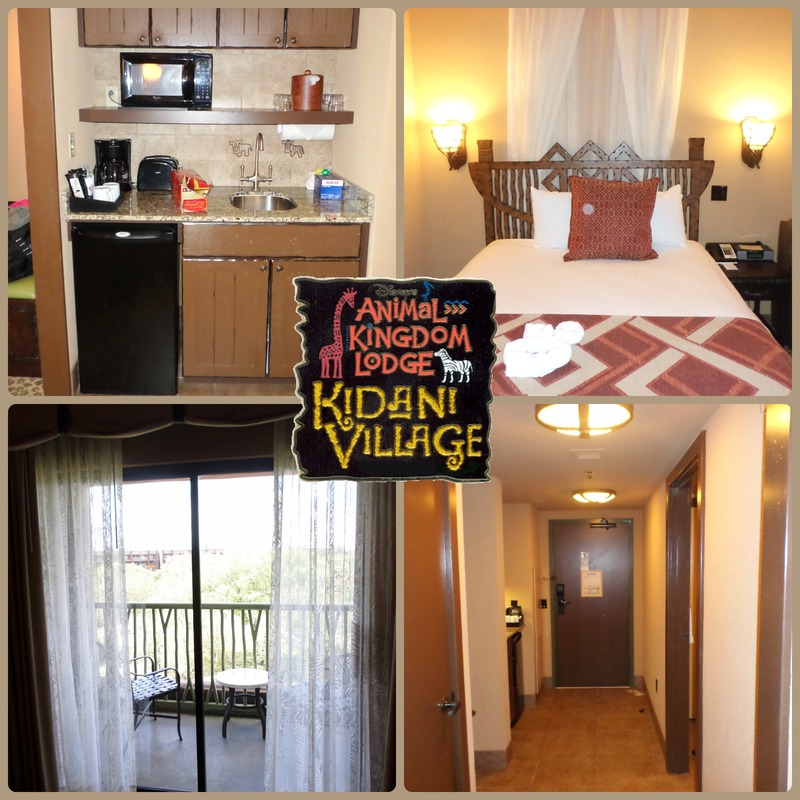 The studios have kitchenettes with a microwave and mini fridge and the two bedrooms and up have full kitchens. Room service isn’t included nightly; this is only done once per stay unless you pay extra for room service midway through your stay. They will refresh your towels and shampoo occasionally throughout your stay at no extra cost. As you can see, this is very similar to how traditional timeshares run their properties. What is the Difference between this and a Traditional Timeshare? Selection of Resorts Depending on the timeshare company, these range from a handful to hundreds All of disney’s hotels, resorts, cruises, and all of RCI’s resorts as well. Flexibility of Points Blackout dates can exist and you are sometimes forced to use points within the year of earning You can bank or borrow points. The points use is very flexible. No blackout dates exist. Pressure Very high pressure sales pitch Sales pitch is relatively low pressure but they are trying to sell you on something, so understand that. Quality of resorts Highly variable depending on resort you choose within the timeshare company. Very consistent – all resorts are owned by Disney (except for the RCI resorts) and all have the same level of quality and customer service. This is what I say to most people who want to know how much it costs – it’s about as much as a car. So, if you could afford a car right now, you most likely could afford to buy into DVC. For us, the monthly payment is similar and the overall cost is also similar. We bought in about two years ago. At that time, it was about 150 dollars a point and they had a promotion going on where you got that years points and the previous year’s points at the time of purchase. We bought 150 points as that is the ‘standard’ number of points that most typically buy. So, our mortgage came out to about 22K plus the monthly dues that we pay to Disney. We financed it with a mortgage over 15 years and thus pay monthly payments for both the timeshare and the dues. We will pay this until the mortgage is paid off (similar to how you would with a car or a small real estate development). That’s a nice, glossed over way to discuss the cost. Now the bigger question is – is it worth it for me? I’m going to break this down for you and hopefully it will help you figure that out. 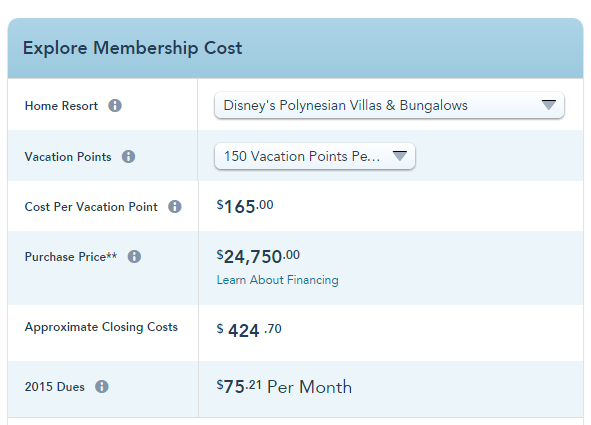 The DVC has a website for members to allow you to calculate the current price of membership and dues. I’ve done this and factored in the cost of a recent stay for us at Bay Lake Tower (a DVC resort that we stayed at with points). You bought into DVC, it’ eight years later, you’ve broken even. Now, you’re staying at Bay Lake Tower again. This is a stay worth 4 thousand dollars. Since you pay only 902 in monthly dues, you’ve saved over 3 thousand dollars on your stay and paid only 900 for the entire week. Basically that means you’re paying 128/night for the contemporary. That’s paying value prices for a deluxe resort. Since you’re a DVC member, you get a bunch of perks, so you get an annual pass with a couple hundred dollars off the top (from your DVC discount) and then your park tickets are paid too. You also go to a few DVC member only functions with free food and drinks; you enjoy being the only visitor to the Disney property to be able to pool hop as a DVC member, and you get to always stay in long term accommodations with a mini fridge, microwave, pull out bed, and more! I understand I’m a little biased because I’m a member but I feel it’s worth every penny. If you visit Disney often, it’s like pre-paying for all your vacations on a monthly basis. 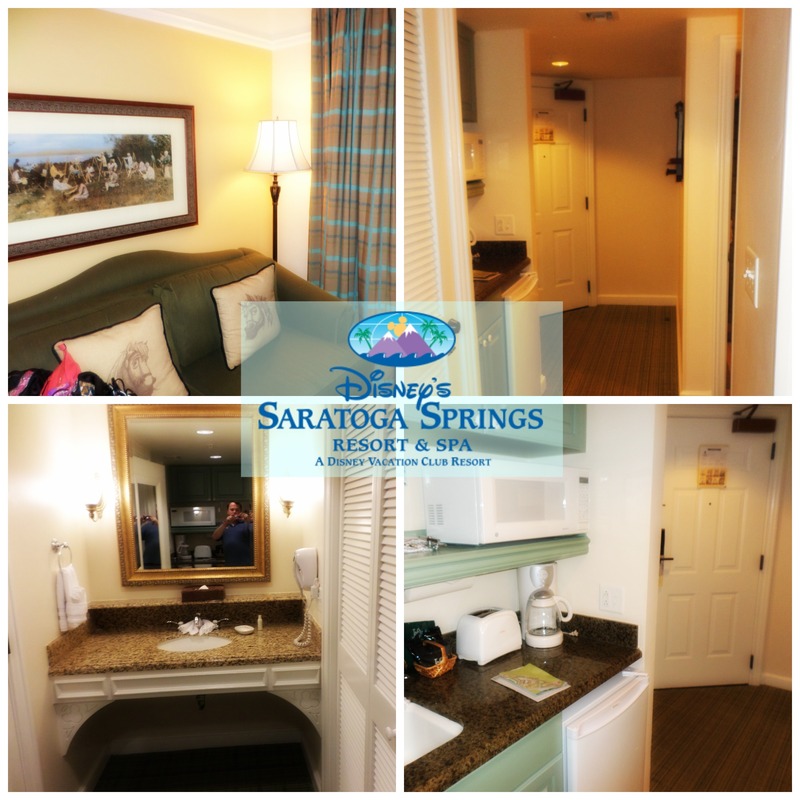 The accommodations are so great, it’s hard to go back to anything else after staying in the DVC rooms. Are there any other benefits of being a member besides the resorts? Discounts on recreation, tours, and more! Is the sales talk really high pressure? I don’t like high pressure sales talks! I’ve been to other off-site timeshares in the Orlando area and I must admit that the folks in the lobby at those places are more high pressure about getting you into the talks than the DVC reps are about getting you to buy. The DVC reps are there to sell you a property, so I’m not going to say they aren’t going to pressure you at all but they aren’t high pressure. They don’t want you buying something you can’t afford but they do want to work with you to get you a DVC plan you can work with. Our DVC rep is the BEST – we absolutely love him and had a great experience with him. He was absolutely nothing like a car salesman, or a typical timeshare salesperson. We were honest and open with him and he was respectful of us and our budget. They even give you time alone as a family after the ‘talk’ so that you can make decisions without the rep in the room. I highly recommend you go talk to one of these guys if you are at all interested in buying in! How do I buy in? Simply stop by any of the kiosks in the parks or resorts that are labeled as DVC and ask to make an appointment. They will take you to Saratoga Springs to tour the villas and talk about the money and points part of buying in. There is even free transport to and from Saratoga springs included in the talk. Some resorts even have an option to dial in on the in room phone to make an appointment. Should I buy through Disney or Via Resale? I hear Resale is Cheaper. I recommend buying through Disney. The only way to use your points for Disney cruises or adventures by Disney (guided trips around the country/world) is by buying directly through Disney. If you buy resale you may get a good deal but you won’t have as much flexibility with your points. Also keep in mind that you will have a shorter ownership window with resale. Say the person you are buying from bought in during the year 2000, their ownership may terminate in the year 2050 as opposed to buying in with the newest resort which terminates in the year 2065. Can I pass on my vacation club to my children? Yes you can. It is deed-able and tax deductible. The DVC rep can answer more off these questions you may have when you make an appointment to visit with them. Can you show me some pictures?